On Wednesday, September 5, 1666, a terrible fire swept through the heart of London, gutting the vast majority of the historic medieval city. Over thirteen thousand homes were destroyed, as well as hundreds of churches and buildings. While recorded deaths were few, it is estimated that over seventy thousand people were left homeless. It was a tragedy on an immense scale, and its memory still reverberates through the English psyche. London by designer Martin Wallace is set in the immediate aftermath of this calamity. It is time to rebuild the city, and numerous individuals strive to shape the city’s growth and leave their mark on its development. Players assume the role of these aspiring developers, hoping to construct buildings, rebuild the city, and turn a handsome profit. While there is a board depicting twenty boroughs of London, this is primarily a card game. Players will acquire and construct various buildings and improvements, reap the rewards of these improvements, and hopefully earn a profit. However, poverty is a persistent problem, so boroughs must be developed to house the people and keep them fed and relatively happy. Most of this is facilitated by the deck of cards. Cards depict various buildings and improvements, which gradually improve and become more sophisticated as the game progresses. In addition to appealing art depicting the subject of the card, each card graphically displays a number of different aspects. These include the cost to purchase the card, the cost that must be paid when “running” a city, the benefits derived when the city is run, victory points earned at game’s end, whether the card is flipped after use or maintained, and any special powers conveyed or conditions that must be met to play the card. Players each receive a set of building counters, six cards, five pounds, and five poverty points. The reconstruction of London begins. The turn sequence is extremely simple: take a card and take one action. This simplicity, however, belies the tough choices and proper management that is required to perform well. When taking a card, a player may take the top card of the deck, or one of the face-up cards on the board. Initially, there are no cards on the board, so taking a card from the deck is the only option for the first turn or two. Once cards begin to appear on the board via discards, players have a choice of which cards to take. The board has space for ten cards in two rows of five. Play Cards. A player may play as many cards from his hand as he desires, placing the cards face-up in front of him into his building display. A card may be placed in a new stack or on top of a previously played card. The more face-up cards a player has, the more benefits he will receive when running his city. However, this will also result in more poverty points, so there is an incentive to restrict the number of stacks. For each card played, a card of the same color must be discarded, being placed onto the board. Thus, it is smart to collect cards in pairs of matching colors. Cards can often modify current or future actions. For example, a school card in a player’s building display allows the player to discard a card of any color when playing a card, which can prove quite handy. When placing cards onto the board, if all spaces are filled, the top row of cards is discarded and the cards in the bottom row move up. This keeps the display of cards fresh. Run City. A player may decide to run his city, reaping the benefits of whichever cards in his display he chooses to activate. Benefits are usually money, victory points, and/or the reduction of poverty points. Some cards have a cost to activate them, usually paid by discarding cards. Most cards must be flipped when used, so they are no longer available for future turns. Choosing which cards to use when running a city can be a tough decision. After running a city, a player must calculate the poverty points gained or lost. A player adds the number of stacks in his building display and the number of cards in his hand. From this he subtracts the number of boroughs he owns on the board (explained in a bit). The result is the number of poverty points gained. If you haven’t already guessed, poverty points are not desirable, as they will ultimately cost a player victory points. Keeping poverty points to a minimum is usually a major goal. Buy Land. A player may claim one of the boroughs in London by paying the specified cost and placing an ownership token onto the borough. This results in an immediate gain of cards, and will earn victory points at game’s end. Purchases begin in or near the old city center and spread from there. Certain cards yield points based on boroughs owned, and once constructed, the underground can also increase the victory point yield if a station is constructed in an owned borough. Another major advantage of owning boroughs is the reduction of poverty points when running one’s city. There are only twenty boroughs in the city, and they usually get claimed quickly. Take Three Cards. In addition to the one card one must take at the beginning of each turn, a player may take three cards from the display and/or face-down deck. This increases the cards in a player’s hand, which gives him more options, but also increases the poverty points a player must take when running his city. There is a hand limit of nine cards, so players cannot hoard cards. It is important to note that money can be tight – very tight. Players can take loans at any time, securing ten pounds for each loan taken. It costs fifteen pounds to satisfy a loan, and unpaid loans at game’s end cost a player seven victory points apiece. It is generally wise to pay off these loans unless more than seven victory points can be earned with a loan. Play continues in this fashion until the final card is taken from the deck, at which point all other players have one more turn. Final calculations are then performed. Players acquire more poverty points for each card remaining in their hand, earn victory points for boroughs owned, cards in their display (whether active or not), and for each three pounds in their possession. To this they add the victory points they earned during the course of the game. The reckoning comes with the tallying of poverty points. The player who has the least poverty points suffers no loss of victory points. Every other player loses points based on their differential with this player. The greater the disparity, the more victory points will be lost. This can result in a loss of a single victory point if a player only has one or two more poverty points, or dozens of points if the disparity is in the double-digits. While some of this disparity can be recouped during the game, it is extremely difficult to overcome double-digit losses. In many respects, London could be considered what is often termed an “engine-building” game. Players must acquire cards that work well together, compounding the benefits earned. One card should support another, and when properly assembled, a consistent stream of income and benefits should result. This is a definite goal in London, but it is made even more difficult by the fact that most cards are flipped when used. Thus, it is very difficult to maintain an engine over the course of several turns. There are a wide assortment of cards, many with special powers and abilities. Deciding which cards to select from the board display can be tough, as can deciding which cards to discard when playing others into your display. There is a temptation to activate all cards in one’s building display each time you run a city, but conserving some to a later turn can sometimes be wiser. What is even wiser is to secure cards that allow you to flip other cards instead of ones that you desire to use again. All of this requires careful thought and planning, as well as taking advantage of opportunities as they arise. This isn’t easy, but it makes for an intriguing challenge and a tense, exciting game. London has fairly simple and straightforward rules. It is easy to learn, teach and play, but it is very difficult to play well. Players are forced to try new strategies each game as the cards will appear in a different order each time. This keeps the game fresh, challenging and intriguing. Although Wallace’s games aren’t traditionally prone to generating expansions, this could be an exception, as it is easy to envision additional building cards being made available. That would certainly be welcome, as it will continue to add to the options and difficulties in mastering the game. High marks to Wallace for designing a game with an intriguing historical backdrop that is easy to play, yet extremely challenging and enticing. Patrick Brennan: (2 plays). It’s a pretty standard tech buying tableau game with a number of one-use-only cards which means you’re constantly re-building your tech set, providing some intra-game variety. All good and fine … except for the killer downtime while each player on their turn evaluates whether to pick up from the display of up to 10 cards (assessing all their different powers), or pick up blind. Then working through their options in their hand. Which can be interesting on your turn as you evaluate and move between different combinations and strategies, but urggh when it’s not your turn. After a couple of plays, the promise of interesting strategies also seems to diminish – you want to make money, convert it into VPs via cards or boroughs, get your poverty cubes down. Which cards you use may differ on how you do it, but all their end-effects boil down to this. The cards just keep coming each turn, and you need to play them out to keep your poverty down, so the tactical card management process offers little variety. Lastly, the game doesn’t provide much thematic pull. You play in your own little world with little player interaction or tension. It’s for tech card game lovers only. Ted Cheatham: (3 plays).To me, this is a great Martin Wallace design. It is a clean, straightforward engine building game. Player interaction is limited to racing for spaces on the board and discards to the main pool for other players. Also, it has those mean little negative poverty cubes (can you say rats in Notre Dame?) which you must track against your opponents or suffer severe wrath. Patrick is correct on the potential for Analysis Paralysis. But, if the games moves, it can be quite pleasant. Larry Levy: (about 8 plays) This is a very accessible and straightforward game from Wallace and one of my favorites from last year. The process of building and running your city is easy to get into and very enjoyable. There’s lots of different strategies to explore, particularly in how large you’d like your city to be. There’s also a good deal of variety, as the mix of cards means that each game tends to play out fairly differently. I’ve played with both 3 and 4 players and while the game works fine with 4, I think 3 is the sweet spot. There’s less downtime, the game seems snappier, and the 90 minute duration is quite achievable with experienced players. Basically, the fourth player doesn’t seem to add anything to the gameplay. A number of people say it also plays well with 2, but I haven’t tried it with that number. I suppose AP could be a problem with some players, but most of the card powers are pretty straightforward and the iconography makes them easy to take in. Besides, only about a third of your turns will be spent in selecting a lot of cards. Almost all of my games have had good pacing. London just isn’t a game I think of when the subject of AP-prone titles comes up. My biggest problem with the game is its low level of player interaction. This is a genuine issue, but it’s something I’ve learned to live with. It’s also not quite as thematic as we’ve come to expect from Wallace (the trappings are there, but I don’t really feel like I’m rebuilding a city). However, those concerns take a back seat to the fact that this is a very enjoyable game to play and is easily taught and learned, but it still has a reasonable level of depth. It’s not quite up there with Wallace’s best, but it definitely adds to his already considerable legacy. 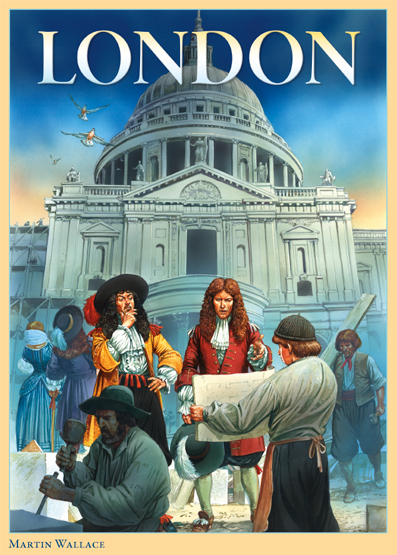 Jonathan Franklin: I enjoyed my first play of London a great deal and it went on the buy list. It had tech, card interactions, a spatial element and nice range between a small clean city and a sprawling dirty one. We had an entertaining post-mortem about which cards were too strong, knowing that it is impossible to know such a thing after one game. My second game was less exciting because I had seen the cards before and the map/board felt a bit superfluous. I would be happy to play a third time, but I don’t feel a particularly strong tug to get that third play in for some reason. For the record, I like games that are derided as multiplayer solitaire, so I don’t think that was my issue. For me, I think it was the lack of ‘aha’ moments when the penny drops. For these card combo games, I need the occasional jolt when you realize that a hand of junk has real potential if you draft that card sitting in front of you that you had thought was useless. Mary Prasad: I have played the game twice. The first game was with three players and went fairly quickly. I believe the second game was with four players – I just remember it dragging due to one of the players playing slowly. Also, since it’s a fairly solitaire game, having more players will add to the wait time between turns. I would like to try the game with two but I likely won’t play with four again unless they are quick players who are already familiar with the game. On a more positive note, this is one of my favorite Martin Wallace games. I probably would rate Tinner’s Trail higher but then again that may depend on my mood since they are quite different games. What I like most about the game is collecting and balancing cards in hand, playing the cards down, and running the city. There is a nice variety of card types and most seem to have a good balance in the advantages they offer, i.e. I don’t think there are any “too powerful” cards – although there are definitely better cards and worse cards. It is fairly easy to get rid of unwanted cards because of the building (and in some cases running) costs. Tom Rosen: (6 plays) Three players is definitely the sweet spot for London. With two players there’s too much rinse and repeat repetition and with four players there is an intolerable amount of downtime between turns. The biggest issue I have with the game that I didn’t see mentioned above was the predictable cyclical nature of it. I don’t think this becomes entirely apparent until after three or four plays, but now I find myself seeking ways to break out of it just for the sake of seeing something new. You get cards (ideally by buying a district, or just take three cards if you can’t afford a district and don’t want to take a loan), then you play cards, then you run your city. Then you do it all again and again and again. To mix it up you might take cards twice if you don’t like the cards you got the first time, discard a few (down to the hand limit of 9), then play cards and run your city… exciting stuff. I’m overstating my point though because it actually is a game I like somewhat, but it’s getting a bit too repetitive and I fear it may suffer the same fate as St. Petersburg of getting old and stale too fast. The repetitiveness of the game is exaggerated with two players because the deck (which is the game clock) is the same size regardless of the number of players and thus you get more turns in a two-player game and more time to notice that you’re just doing the same few steps over and over. As others have mentioned, the game is a remarkably solitaire experience (no matter how many players are involved). This is far beyond the supposedly solitaire nature of games like Princes of Florence or Agricola, which are not at all solitaire in my mind. This is truly a lonely sort of game. Consequently, adding a fourth player contributes absolutely nothing positive to the game and just makes it take longer between your turns, when you might as well get up and walk around the room to stretch your legs. Thus, three players is the ideal number in my experience and since the game might get old after only a handful of plays, I’d encourage you to make the most of those plays and make sure you sit down to them with the right number of people. 3 plays. I really like this one. I honestly haven’t noticed the solitaire feeling others have mentioned. That’s probably because a) others take the cards I wanted, or b) they provide me with cards I want, or c) they beat me to the borough I wanted. Further, I haven’t notice a burdensome amount of downtime. Usually I’m pondering my next move. But, I will confess that my mind works a bit slower the older I get and so I enjoy the relaxed opportunity to think. I have played it twice with three players, once with four. The game lasted about the same amount of time. Thus far, I have enjoyed the game immensely and rate it near the top of the 2010 Essen games I’ve played (which admittedly is scant, having played only 5: Antics, 7 Wonders, Troyes, London, and Navegador. Hmm, so wanted this one to work. Three games were enough to convince me that you quickly descend into a 3 turn cycle of running your city, taking cards, rebuilding, etc. It rapidly became same-y, and just not interesting enough to justify the 90 minute plus playing time. At least it felt a little different. Quickly moved on. It’s quick, easy and offers lots of strategy. Like this a lot! Also, while you have to do a bit of everything, you can shift focus from game to game. Invest big on cards that are worth a lot of points, build lots of boroughs, or focus on cards that score lots of points.